Minor League Baseball Kicks Up Dust With Changes To Extra Innings, Pitch Clocks : The Two-Way Beginning in the 10th inning, teams will open with a runner already on second. That's one of the rules being tested in hopes of speeding up the pace. Major league extra innings aren't affected. Yet. 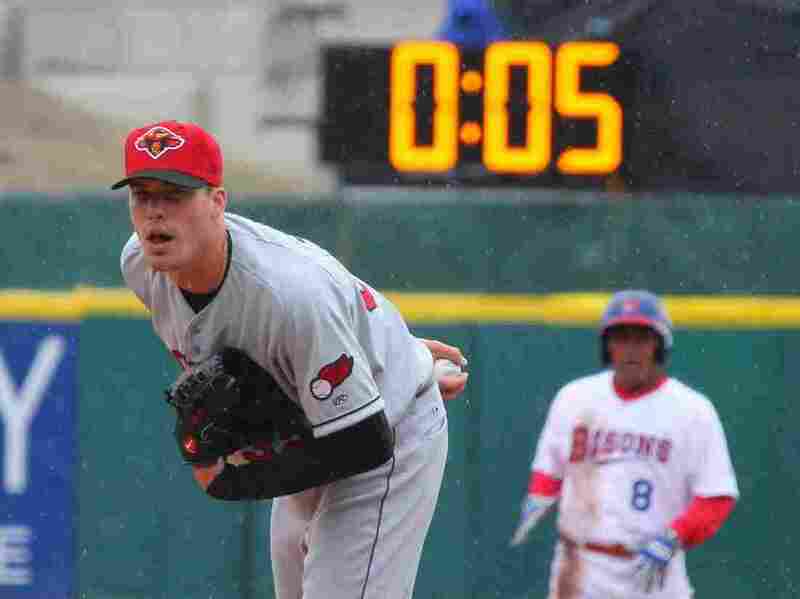 Alex Meyer, then a member of the minor-league Rochester Red Wings, watches for a signal from his catcher as a 20-second pitch clock counts down in 2015. On Wednesday, Minor League Baseball announced it will shave five seconds off that clock when there are no runners on base, among other rule changes. Strap in, purists. This game is about to get a good deal faster. At least, that's what Minor League Baseball officials are hoping. The league announced Wednesday that it plans to institute some pretty big rule changes for the 2018 season — including beginning extra innings with a runner automatically on second base and, in certain situations, shaving five seconds off the pitch timer the league had already instituted in triple- and double-A ball. Now, when there are no runners on base, pitchers at those levels will get just 15 seconds to begin their pitching motion. When runners are on, pitchers will still enjoy the full 20-second clock first instituted in the minors in 2015. If the pitcher fails to meet his deadline, a ball will be awarded to the batter's count, while a strike will be counted against the batter if he's not ready for the pitch. For a 15-day grace period at the start of the 2018 season, though, violators will just receive warnings as they get used to the new system. As for the big rule change in extra innings: Beginning in the 10th, when the leadoff hitter takes his place in the batter's box, the teammate directly ahead of him in the batting order will set up across from him on second base — already halfway to home plate before a pitch has even been thrown. "We believe these changes to extra innings will enhance the fans' enjoyment of the game and will become something that the fans will look forward to on nights where the game is tied late in the contest," Minor League Baseball President Pat O'Conner said in a statement. He added that officials also have the players' interests in mind, saying that lengthy extra innings and longer games can pose health risks, both in the near- and long-term. He noted that their partners in Major League Baseball also have a vested interest in keeping their farm team prospects injury-free. Visits to the pitcher's mound from coaches and other players will also be capped. "We feel that limiting mound visits and decreasing the amount of time between pitches with no runners on base will further improve the pace of play," said O'Conner, "and make it a more enjoyable experience for our fans." Major League Baseball, for its part, will only be instituting a cap on mound visits, deferring a decision on pitch clocks this year "in order to provide players with an opportunity to speed up the game without the use of those timers," MLB Commissioner Rob Manfred said last month. The rule changes were greeted Wednesday by many long-time fans with, let's say, a fair bit of skepticism. Die-hard baseball fans rarely respond kindly to the notion of fiddling with their pastime, and a cursory Twitter search — "really horrendous idea," the "dumbest idea since the glowing puck," "GROSS!" — reveals a little immediate resistance. That reference to pucks is telling, though: If the MLB decides to follow the lead of the minor leagues, it won't be the only major sports league in the U.S. to brave the third rail in recent years with rule changes to speed up play or prevent injuries. The NHL, for instance, got rid of the two-line pass rule in 2005, opening up the game to rink-spreading plays, and has toyed more than once recently with its own overtime regulations to coax more excitement out of the extra period. And the NFL has been chipping away at high-impact kickoff plays, also with an eye toward reducing player injuries.